This sixth report in ISPU's 'Reimagining Muslim Spaces' series presents a case study of the Islamic Society of Boston Cultural Center (ISBCC), the largest mosque in New England. Specifically, we examine its effective navigation of the aftermath of the Boston Marathon bombing in 2013. 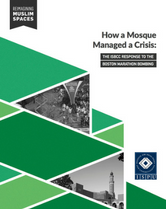 By analyzing what ISBCC did, this report aims to provide American mosques with a set of actions that can allow them to successfully manage such crises and emerge as stronger and better-established players in their broader communities.